Officially declared by Governor Deval Patrick to be Independent Game Development Day in the state of Massachusetts, September 22 also marked the day the first ever Boston Festival of Indie Games was held. Hosted at the Massachusetts Institute of Technology, the event featured an art gallery, a game jam, multiple guest speakers, indie game themed movie screenings, live action role-playing, and most importantly, a showcase of 36 upcoming indie games created by area developers. We attended the event and got some hands-on time with many of the games. After careful consideration, we present our ten favorites. What sets Gimbal Cop apart from most other cart racers is that while up to three players race against each other, a fourth player takes on the role of the architect. 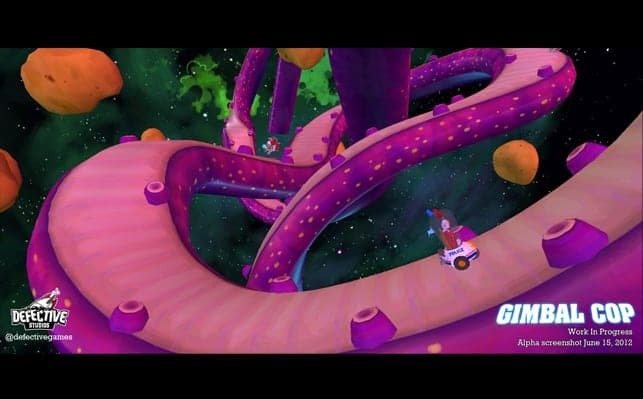 While the racers collect boosts and attempt to avoid falling off the track, the architect is up ahead, dynamically creating the track itself. Although playing the game alone did tend to feel a bit dull, racing against other people live over a local Wi-Fi connection was immensely enjoyable. Gimbal Cop has a lot of potential and we highly anticipate playing the final build, which is tentatively scheduled for release this December on both iOS and Android platforms. For more information on Gimbal Cop, or to take part in the upcoming open beta, head to DefectiveStudios.com. 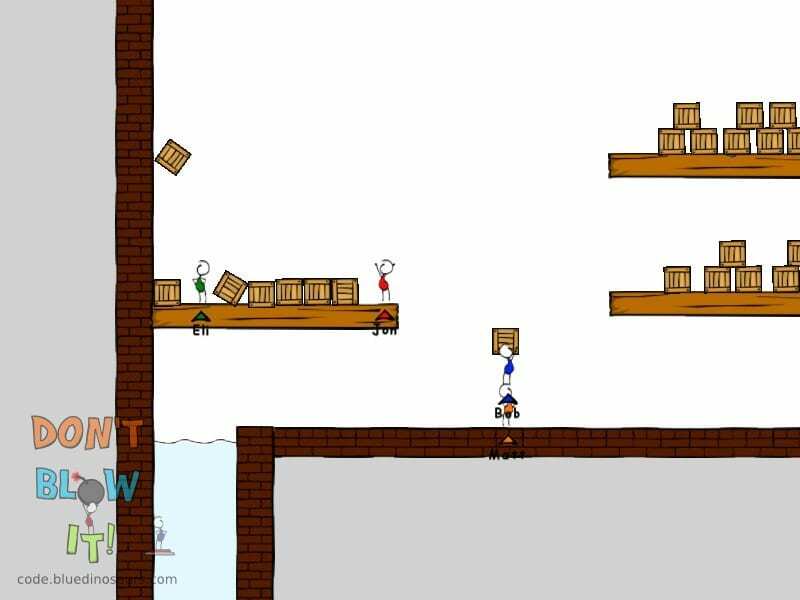 Don’t Blow It is a 4-player, physics based puzzle platformer for the PC. Players are able to collect individual points and obtain power ups in order to solve puzzles, most of which are impossible without cooperation between players. While we were lucky enough to be accompanied by 3 other players, when we initially sat down to play, full cooperation between 4 complete strangers is not an immediate and natural thing. We spent the first several minutes of our demo undoubtedly frustrating John and Casey from DinoMage Games, chaotically picking up and throwing objects (and each other) around the screen. However, after we began to communicate and work together towards our common goal, the game became quite fun. While Don’t Blow It is still early in development, the final build could make for a very fun, family-friendly cooperative experience. For a closer look at Don’t Blow It, head to dontblowit.bluedinosaurs.com. 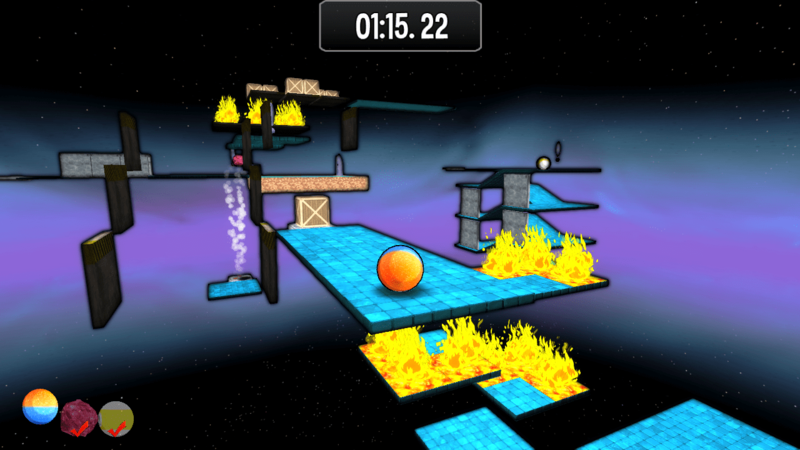 Lost Marbles is a puzzle platformer in which players control a ball that they must safely navigate to the end of increasingly difficult levels. As players progress through the game, they are able to unlock multiple balls that they can switch to on the fly, all of which have different abilities and weaknesses. As a sucker for both Marble Madness and Marble Blast Ultra, we were immediately drawn to Lost Marbles based on the visual style alone. But after sitting down with the game, it was apparent that Binary Takeover was offering more than just a run of the mill marble puzzle game. The levels can be intensely difficult and unforgiving, making completing the puzzles feel all the more satisfying. Lost Marbles should be finished in approximately one month or so, and will be available on Steam for $10.00. The developers also mentioned that they are flirting with the idea of eventually porting Lost Marbles to iOS platforms. However, this idea is still up in the air as it would require reconfiguring a majority of the levels as the game’s difficulty is currently not conducive to touchscreen controls. To see more of Lost Marbles head on over to BinaryTakeover.com. While there were many touchscreen and iOS based games at the festival, Trouble Impact’s Amelia vs. The Marathon was the only touchscreen game that noticeably caught our attention. 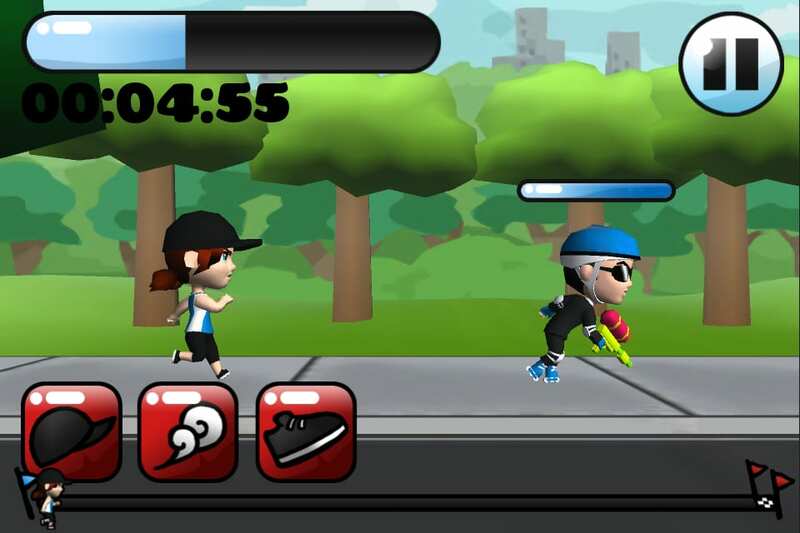 The game puts players in the role of the marathon running Amelia. While running, players must make Amelia dodge oncoming objects with a simple swipe in a particular direction. As players build their speed, the objects become more and more difficult to dodge. While this mechanic isn’t exactly ground-breaking, players also face boss battles at the end of each level. Each boss encounter plays out like a turn-based RPG style battle where players must dodge enemy attacks, and correctly execute their own attacks, much like Bowser’s Inside Story or Paper Mario. While we initially overlooked the game because of its childlike appearance, after playing it we were immediately hooked by its demanding level of precision and timing. After witnessing only three out of the hundreds of festival attendees successfully complete the first level, the developers confessed that difficulty would probably be tweaked down a bit for the final build, which should be out on both iOS and Android platforms in November. To find out more about Amelia vs. The Marathon, make sure to check out TroubleImpact.com. Rite was far and away one of the more unique titles of the festival. Developed by Father Octopus, this humble-looking, 2D puzzle game masks a devilishly deceptive and mind-bending concept. Throughout each level are a series of switches which spawn a parallel dimension. 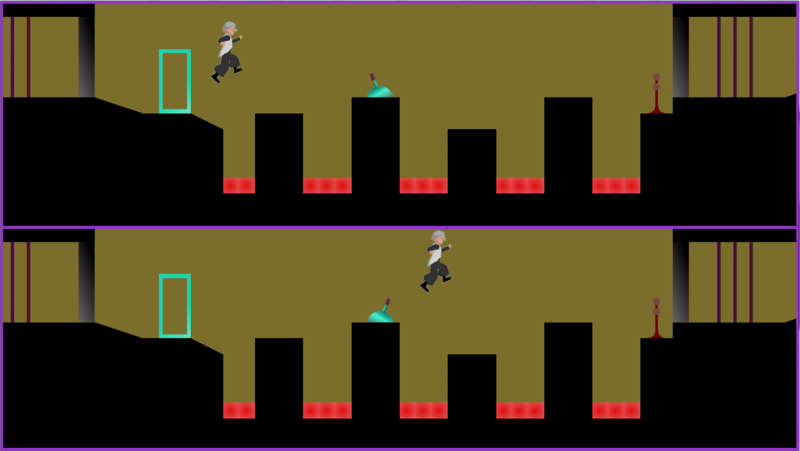 Players must then solve a series of puzzles to move their protagonist to the end of the level in both dimensions. The kicker is that instead of controlling each protagonist separately, they both move through their own mirrored dimension simultaneously in different spaces, forcing players to watch the multiple copies of their character while determining on how their next move will affect each dimension. The timing and concentration required to solve the puzzles is stressful yet challenging, and reminiscent of titles such as Braid and Limbo. While the game is only about halfway through its forecasted 2 year development cycle, we highly recommend checking it out when it is released on PC. To try to further wrap your head around Rite’s multi-dimensional concept, head to the Father Octopus website. 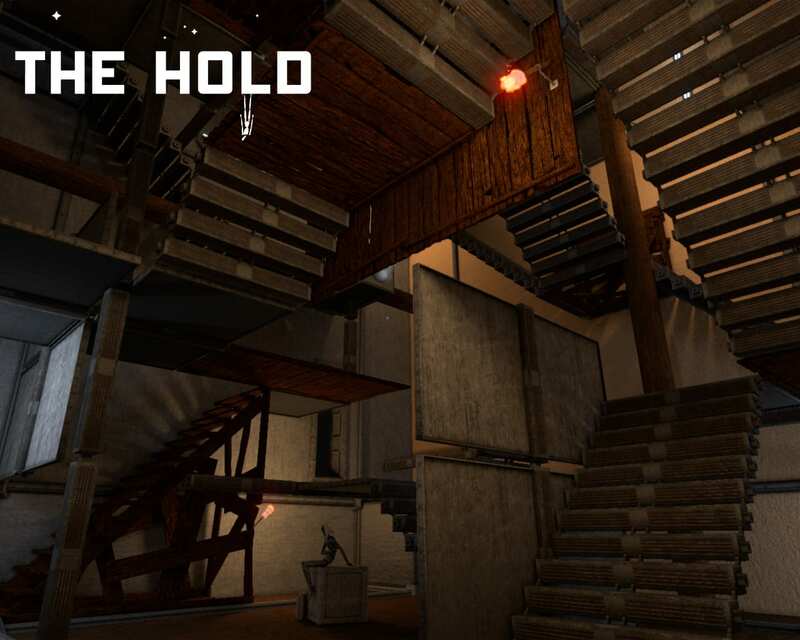 The Hold was another first-person platform puzzler that captured our attention due to its presentation and the world it invites you in the first few minutes. The game starts out with an explosion aboard an intergalactic ship, and then it involves a series of flash screens until you see yourself aboard your ship again, but everyone around you resembles inanimate husks in various positions. Touching these husks rotates your entire environment in different directions, so a wall might become your new floor and so forth. The goal in its level is to find out which husks will rotate your environment in the correct direction for you to move onward further discovering what happened to everyone on your ship. Its eerie presentation, great graphics, and the feeling it creates of being inside M.C. Eschers’ Relativity definitely make The Hold a game to keep on your radar. Upon first glance, Candlelight may remind you Limbo due of its monochromatic graphics that make its characters look like shadow puppets amid a shadowy world. But after delving into its gameplay and realizing you’re actually controlling two characters at the same time, you’ll realize this game is something you may not have played before, but definitely should. Candlelight has you controlling two characters, a boy and a girl, who each have a unique ability that both helps and impedes them on their journey. The boy, for example, always carries a lantern with him that makes hidden object like platforms appear as he approaches them. Other times, however, he’ll approach a doorway only to have his lantern reveal a gate blocking his path. It is then up to his female companion, who will have her own unique ability, to go ahead and find the solution for them to move forward together. When characters move away from each other, the camera also follows each one in a split-screen arrangement. While it may look like a multiplayer co-op game from afar, Candlelight is actually made for one player and will force you to use your brain to figure out its puzzles and defeat its enemies, something that is sure to spice things up once they are implemented into its currently soothing gameplay. Candlelight is being created by the two-person team at Idle Action Games and still has a long way to go in development. Let’s hope we all get to play this great indie title sometime soon. One of the many mobile games on display at the Festival was Prime’s Quest, a charming moving-block puzzler that was set in an apocalyptic world. The goal is to tap and slide puzzles on the screen to clear a path for the protagonist to reach the exit. One mechanic that elevates the game from just another moving-block game is the use of items Prime will find along his path such as a hammer that can be used to divide blocks allowing you to move them in new ways. Later on, land mines will also destroy any block that moves past it further adding to the game’s basic formula. Prime’s Quest played smoothly and reminded us of the many moving-block puzzle games seen in popular titles such as The Legend of Zelda series, but the item implementation, hand-drawn graphics, and added challenge of collecting soda cans in each level before reaching the exit all together make for a great new experience. Prime’s Quest is in development for iOS devices. You can sign up for the game’s beta by visiting the developer’s website. 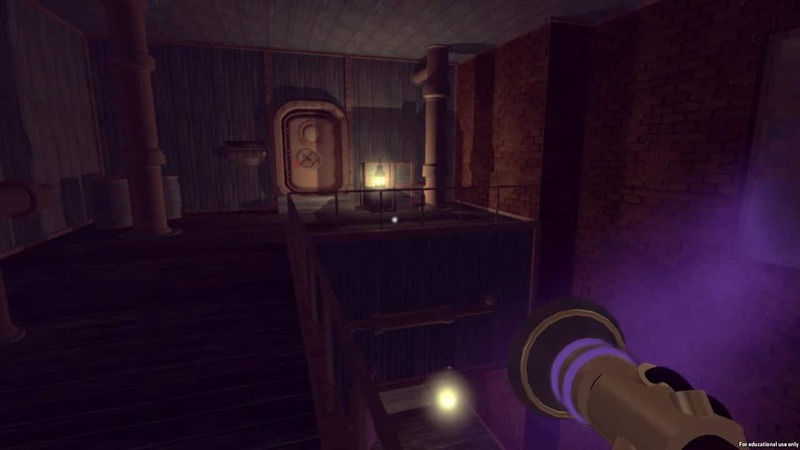 Photons takes players on a descent into darkness where they will need to use a special flashlight to solve puzzles and unravel the mysteries as to why the world is covered in darkness. The game is inspired by other first-person platform puzzlers such as Portal, but it uses its own mix of light and dark to create unique puzzles and situations for players to experience. For instance, there are pits filled with dark miasma that you’ll need to shine your light on to solidify them and create light platforms. But your flashlight can also shine black light, which opens up brand new mechanics such as scoping your surroundings for hidden messages and lock combinations that can only be seen under this black light. The game definitely has an eerie feel to it, and the demo we played sets the tone for its underlying story and unknown characters. Photons is the endeavor of the two-person Electric Coffee Games studio as only been in development for a few months. Already looking quite promising, we can’t wait to see more. Developed by kid-friendly CloudKid studio, Negative Nimbus is an upcoming game for iOS and Android devices that tells the story of a cloud that just can’t hold it in. His visits to the land of Sunnyland might mean water for the thirsty flowers below, but without your help, everyone else is bound to get wet. Each level sees Nimbus scrolling along to the finish line and raining down on everyone below. You’ll need to tap and hold down your finger when he’s right above anyone other than flowers to finish each level with the highest score possible. Later levels will even introduce more challenges such as tapping on flower buds to wake them up and slashing cages off flowers. Negative Nimbus has a very kid-friendly presentation with fun characters and colorful graphics. In fact, we were told the game originally started out as a rhythm game, and the catchy music might even make you tap your finger to the beat. Its challenges and humor make it a game all ages can appreciate. Look for it in November. The Boston Festival of Indie Games showcased some of the best local games talent, and at the end of the night awards were given to participants voted on by attendees. Best Game Design went to Track, a 2D shooter. Prime’s Quest picked up the Best Technical Quality Award and Negative Nimbus won the award for Best Visual Art. The award for Best Audio Design went to Jack Lumber, an iOS game starring an energetic lumberjack. Finally, Resonance won the Best Narrative Award. The Boston Festival of Indie Games had over 2,000 registered attendees and was a clear testament to just how far the independent development community has grown both in Boston and throughout the country. It was great to see developers, fans, families, and even those who had never played a game before come by and experience the joys of creating and playing video games. Look for next year’s festival to be even bigger. Blast Editors Corey Atwood and Giancarlo Saldana contributed to this article.  hiking and other rural tourism activities. cash that you can put into savings that will become your getaway fund. never understand. It kind of feels too complex and very broad for me. writing posted at this site is genuinely fastidious. It will always be useful to read through articles from other authors and use something from their web sites. That is a good tip especially to those new to the blogosphere. Simple but very precise information… Many thanks for sharing this one. A must read article!